This is old version Parallel Space 2.2.5431 apk for Android, you can install it if you want to downgrade or install old app. It is top Tools apps from LBE Tech. This interesting application will be very useful for gaming or social networking. It is also able to separate among your personal application, accounts, and work. The good thing about parallel space is that it mostly supports all applications. 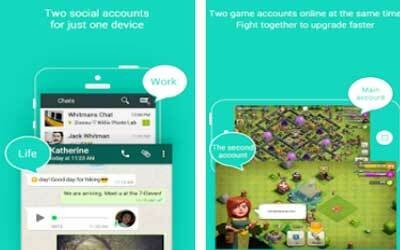 Besides it can be used for running multiple social accounts on one device, you will have the fun gaming experience. In addition, you also get the double gaming experience on one device. Now you can play two accounts for games at the same time. For social networking, you can connect it with different friends using second Facebook account. You can also share photos with second account of Instagram. This application can be used for hiding the favorite application on your phone. The applications you are going to hide will be invisible. Thus, you do not need to worry if your favorite apps will be known by other people. Parallel Space for Android is also powerful and easy to use. Balance your life and work easily. Double your gaming experience and have more fun. Almost all apps are supported. Enjoy your favorite apps without worrying about caught by your friends and colleagues. Powerful and stable, while easy to use. Unique: Parallel Space is based on MultiDroid, the first application virtualization engine on Android.